The Group has just produced its latest book in the Somerset Villages series. The three year study has been based in the parish of Stogursey, west of Bridgwater , where SVBRG has recorded and researched one hundred and twenty properties (about one half being in Stogursey village itself), seventeen associated farmsteads plus two independent farmsteads, and has reviewed the findings to gain an insight into how and when these parish properties developed over the last 500 years. Throughout we have had the support of the Stogursey Amenities Group and their enthusiasm plus the added interest of a coast-line, castle, former priory, village church still displaying its Norman origins, a borough, a 1614 estate map and a large area of common land that survives to this day made the parish a very different and exciting addition to our ‘village studies’. Equally, until the 18th century there were eighteen manors, a pattern of land-holding that is peculiar to this parish in Somerset. The arrival of the Acland family in the mid C18th was also to influence the parish. Structural evidence of domestic development from the late medieval period (14th and 15th century) has been exceedingly sparse. 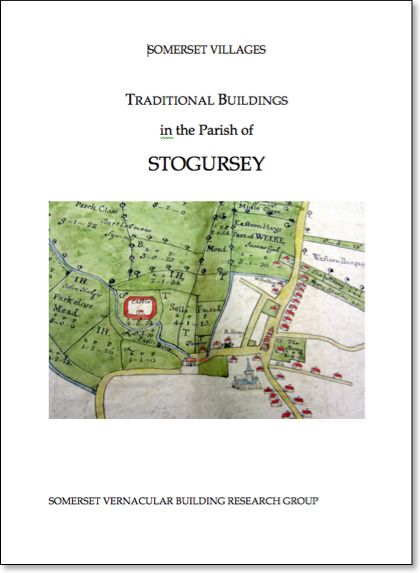 Some limited evidence has however been found in the more substantial houses outside Stogursey village. There may well have been other houses of similar quality within the village but, probably due to rebuilding and renovation, they have not survived. Brief summaries are offered for each house and there is a tabulation of their principal phases of development.